It’s been on my bucket list for years, and this year I can finally say that I have ran the iconic London Marathon. Actually I ran more than a marathon, 27.1 miles according to my Nike Running, but I did it and I’ve got the medal to prove it! 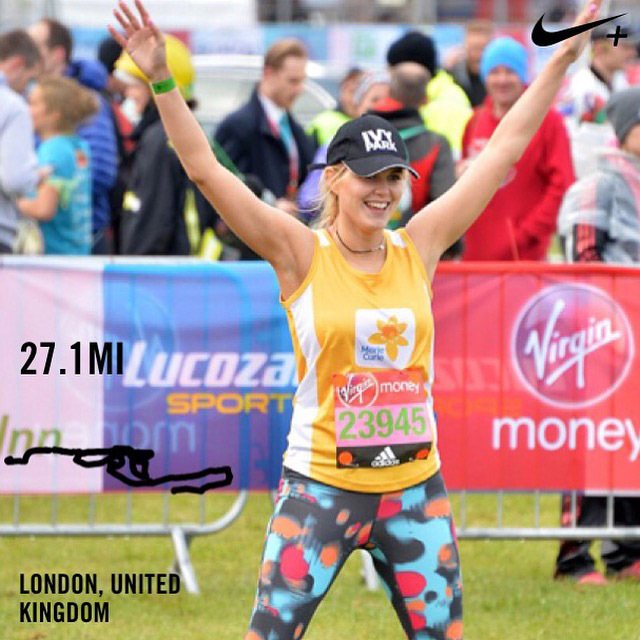 So I thought I would share my experience of running the London Marathon with you. 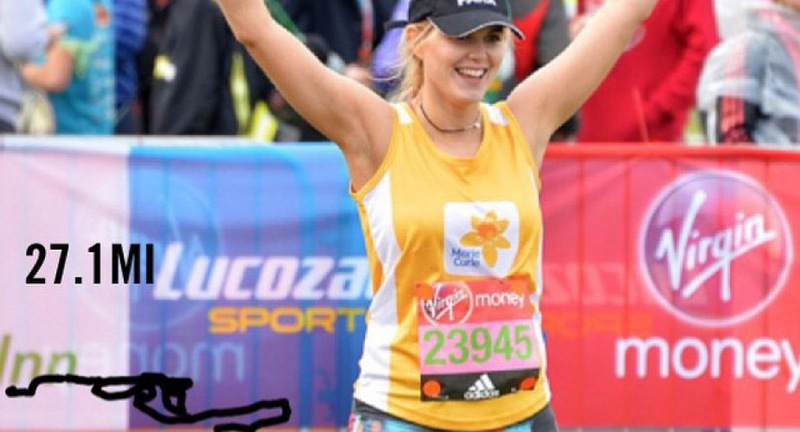 I decided, when watching the 2015 London Marathon slightly hungover from the comfort of my sofa, that in 2016 I would be a better human and finally complete the marathon, so it seemed like fate when Marie Curie asked if I would like to run for them. Despite having nearly 9 months notice, long enough to have an actual baby, I somehow kept all my training until a month before, so to say the looming marathon date was nerve-wracking is an understatement. I mean, I’m not going to claim I did zero training, I was training with James Crossley and going to Barry’s Bootcamp several times a week, I just didn’t do any long distance running, and everyone else was. So in the final four weeks before the marathon, and after all my friends were telling me how screwed I was, I decided to do several runs and I managed to do a seven mile run ahead of the big day. But for some reason I felt confident, I’ve always loved running and in my experience of running half marathons, the buzz of the crowds usually gets me through the day. So fast forward to the morning of the London Marathon, I felt a combination of fear, apprehension and excitement. After a really bad night’s sleep (ok, I was really scared), I made my way to the Tower Hill hotel for 7:15am and got the VIP shuttle bus over to the Greenwich where it would all begin. We weren’t running until 10am so had a couple of hours to prepare ourselves and drink lots of water. If I run again, I would definitely bring warmer clothes as I was freezing standing around in just my running gear. I’d recommend bringing old clothes you don’t mind losing so you can ditch them when you’re running. At 9:30am I was invited to talk live on the BBC, and was interview by the oh so lovely Colin Jackson, and I must admit that I felt really proud as I thought back to the year before when I’d been watching the same TV coverage and here I was now doing it for real! Plus I knew my family were all watching and tracking me. 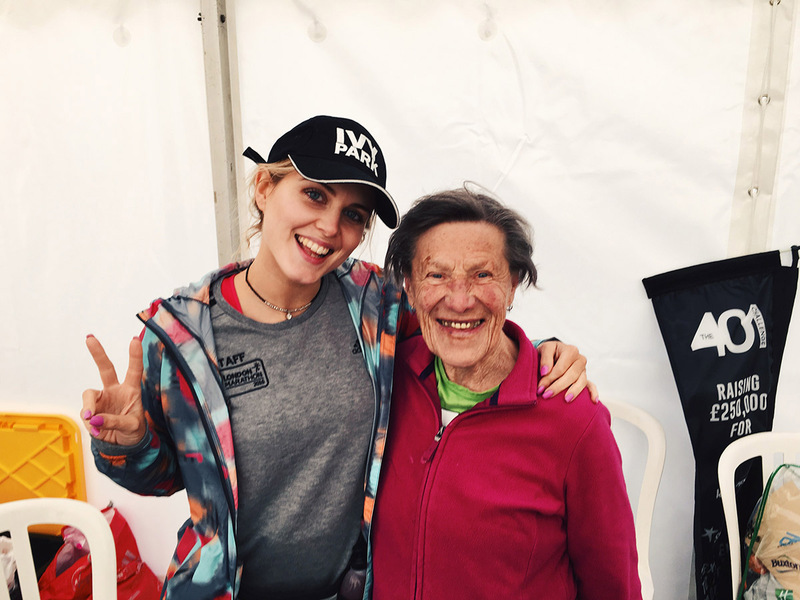 Just before I went to the start line I met Iva, the infamous 88 year old lady who has been running the London Marathon now for about 20 years. She was so excited and full of life, and it made me hope I still have that passion for life and adventure at her age. Meeting her was really inspiring and she gave me the best tip ahead of my run: “If you think you’re going slow, go slower”. And then we were at the very front of the start line waiting until 10am so we could begin our run. There was such a buzz, but I was also thinking that I can’t believe I’d be running for at least four hours! It’s a really scary thought. 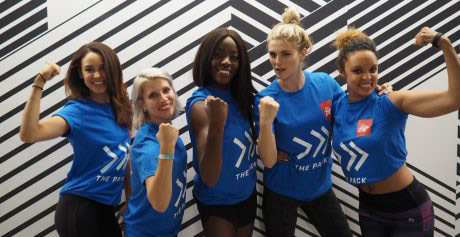 But then the buzzer went off (it could have been a gun, a siren, a voice… I actually can’t remember, I just remember thinking ‘this is it!’ and moving my feet and pressing ‘begin run’ on my Nike Running App. This was it! There were crowds along the whole course, some areas were busier than others, but they were there. It was amazing to see how many people came out to support everyone, and I remember feeling so honoured to be part of the day. I kept thinking of Iva’s wise words but it was actually quite hard to go slowly because of all the crowds of runners, and probably all my stored up adrenaline too. I felt totally fine until about the 9th mile when suddenly I got cramp in my left calf. I probably should have warmed up! I considered stopping to stretch but I thought that the moment I stopped things would start to get harder so I turned my music up and ran through the pain. Seeing the Tower of London was incredible, mainly because it was the first exciting landmark I saw, but also because my sister and my agent were standing there (admittedly I didn’t see my sister, but I did see my agent as she’d made an awesome sign, but just knowing they were around there made a big difference). After the bridge is when I started to hit a wall. As I ran my thirteenth and fourteenth mile, I looked to my left and saw all the professional athletes running their 22nd mile. It was quite a lot to overcome mentally that I still had ten miles to run. I think that mental knowledge is what made me hit a wall, but suddenly everything began to hurt. My right knee felt like I was crushing the two bones together at the joints and my lower back was aching – I couldn’t decide if it was my leg joints or my kidneys. It was from that point on that I faced what was the biggest mental battle I have ever dealt with. Part of me kept telling myself to walk as I was exhausted and in pain, but the other part of me had promised myself I wouldn’t walk. Plus, I knew that if I walked the run would take me longer and I wanted this torture to stop, plus I wanted to know in my heart of hearts that I had given it everything I had. So I continued to run. Left, right, left, right. It sounds silly but that’s what I told myself for ten miles – left, right, and again. When I reached the 21 mile mark I remember going under a bridge and suddenly feeling very spaced out. I felt like I might pass out from exhaustion and I wanted to burst out crying, but I quickly checked my phone and saw a text from my sister saying she was waiting at the 23 mile mark so I told myself to keep going until I saw her and then I could walk. The 23 landmark came and went and despite my best efforts I didn’t see my sister but at that point I was so close, plus there were so many people crowding the embankment along to the finish line I felt like I just couldn’t stop. It was a bleak moment when my Nike Running app announced I had completed the Marathon distance when I was still a mile from the finishing point – note to self (and to you guys) that if you ever run a marathon make sure you always run on the inside corners otherwise the distance increases quite a lot. I dragged myself all the way to the 800m mark and those last few metres felt like a lifetime but suddenly I was through the finish line and it was over. 27.1 miles were complete. I was so happy. I was asked straight away to do press photos, but the moment I stopped running my legs completely seized up with the most painful cramps, so I grimaced my way through the photos (I’m actually leaning over in pain! ), and then I made my way to the hotel for Marie Curie’s reception. That should have been the easy part but I was in so much pain I had to sit on the floor for a while and recover! With Iva, the marathon running legend. I officially managed to complete the run in a respectable 4:10 (although according to my Nike Running, I ran 26.1 miles in 4:01). It was such an incredible day and most importantly I managed to raise nearly £2000 for Marie Curie. You can still sponsor me on my JustGiving page here. If you’re thinking of running the marathon then do it, it’s the most challenging yet rewarding day ever. I keep looking proudly on at my medal. That’s one thing ticked off the bucket list, now what next? 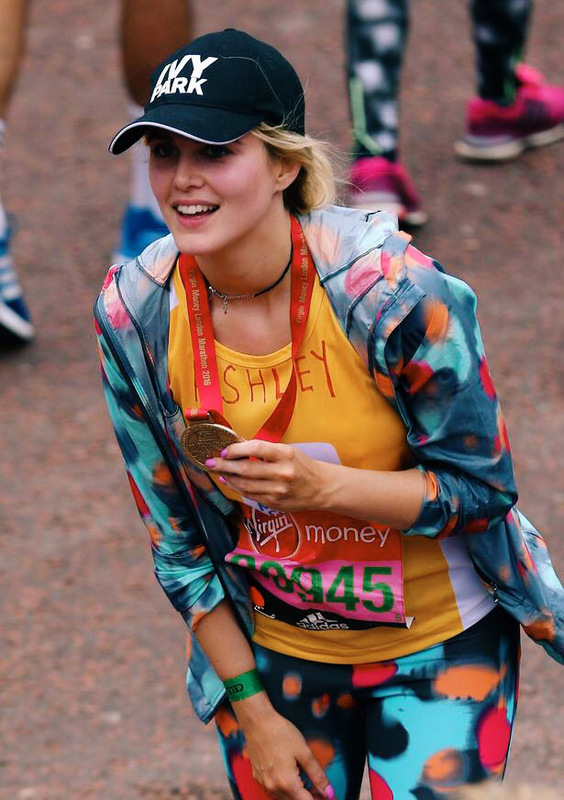 Did you run the London Marathon? I’d love to know your experience, was it similar to mine? Or has this post encouraged you to sign up next year? Let me know!